If you need a crash course in polymer rheology, the tag line above is a great way to sound like an expert. This plot is iconic: it's something that everyone in polymer science is exposed to. 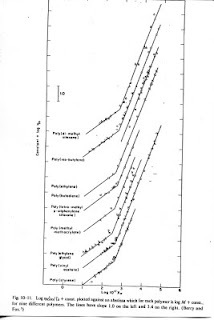 Viscosity increase linearly with molecular weight until a certain critical value is reached, after which entanglements dominate and the viscosity increases with molecular weight to the 3.4 power. Not the third power, but the 3.4 power. Since the molecular weights to reach these entangled states are pretty low, most commercial polymers are entangled when molten. Hence the title of the post. That difference of 3 vs. 3.4 may seem pretty small, but it is substantial. An early result in the development of reptation theory predicted the value 3, not 3.4. Since everyone knew about the 3.4 value, this was initially seen as a huge problem. Certainly it was a case where close didn't really count. My research advisor completely wrote off the theory as a result and never exposed our group to at all. I once attended a lecture by Sam Edwards, a co-developer of the theory and it was fun seeing him try to soft-shoe his way around the issue. I'm not sure how the dispute has ended up. Reptation - the idea that polymers can basically only move in the direction of the chain in the same way that snakes and other reptiles do (hence the term "reptation") - has been observed in neutron scattering experiments so there is a reality behind all this. This post has been all about molten polymers. But entanglements also play a huge role in the solid state too. That will be in an upcoming post.